Edinburgh EH1 3EG United Kingdom. 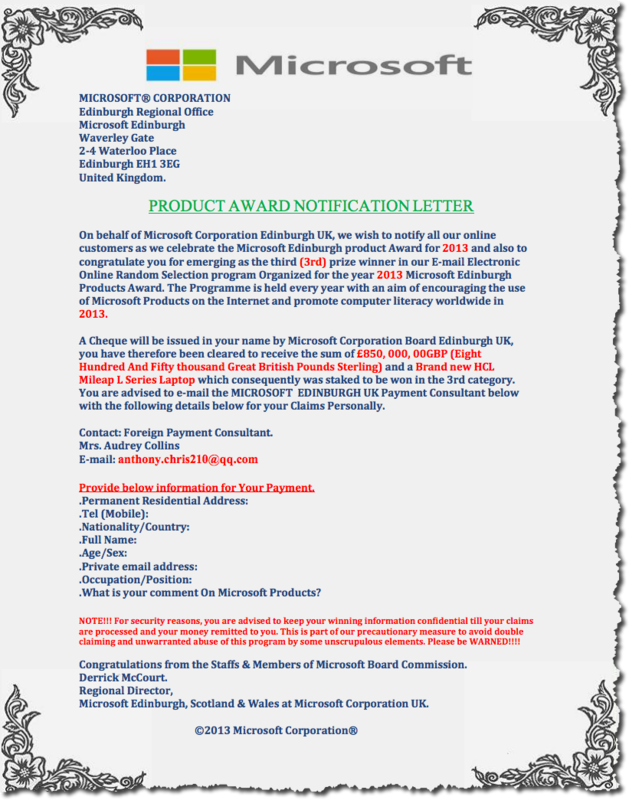 On behalf of Microsoft Corporation Edinburgh UK, we wish to notify all our online customers as we celebrate the Microsoft Edinburgh product Award for 2013 and also to congratulate you for emerging as the third (3rd) prize winner in our E-mail Electronic Online Random Selection program Organized for the year 2013 Microsoft Edinburgh Products Award. The Programme is held every year with an aim of encouraging the use of Microsoft Products on the Internet and promote computer literacy worldwide in 2013. A Cheque will be issued in your name by Microsoft Corporation Board Edinburgh UK, you have therefore been cleared to receive the sum of£850, 000, 00GBP (Eight Hundred And Fifty thousand Great British Pounds Sterling) and a Brand new HCL Mileap L Series Laptop which consequently was staked to be won in the 3rd category. You are advised to e-mail the MICROSOFT EDINBURGH UK Payment Consultant belowwith the following details below for your Claims Personally. Provide below information for Your Payment. NOTE!!! For security reasons, you are advised to keep your winning information confidential till your claims are processed and your money remitted to you. This is part of our precautionarymeasure to avoid double claiming and unwarranted abuse of this program by some unscrupulous elements. Please be WARNED!!!! Congratulations from the Staffs & Members of Microsoft Board Commission. Derrick McCourt. Microsoft Edinburgh, Scotland & Wales at Microsoft Corporation UK.